Call of Duty WW2 is going back to where it all started. While we've already seen some of the campaign and characters, learned a little about the all new multiplayer and zombies, there are still plenty of questions. And who better to answer them than Sledgehammer co-founder Michael Condrey? Leon Hurley: World War 2 only has a finite amount of stuff, have you gone for classic moments or have you tried to find the gaps in between? Michael Condrey: We wanted to tell a story based on real events but unique to us. Our squad is First Infantry, but it’s twelve men and their journey, so it’s very unique and we have a story that interacts with the Bridge Troops and connects into the liberation of Paris, that was unique to telling the story we wanted to tell, and so it was neither trying to tell a recap of somebody else or trying to find the gap – it was really based on this emotional narrative we wanted and there were a lot of people involved. They say something like 600 thousand came through Normandy at some point, right? So there are plenty of stories from infantry to armour to airborne and we had a lot to choose from. LH: We seen the beach landings in the game and it captures that sense of it being such a meat grinder. It wasn’t so much a heroic assault, as throwing everything at it and hoping something gets through. MC: Right? It was an incredible experience and if, as you know, it was weather dependant – the shelling didn’t go off the way it was supposed to, planes couldn’t fly because of cloud cover so that conflict... man, I can’t even imagine. In fact, I was reading a story about a British soldier who landed – survived – and he was hit three times before he made it to the road on the other side of the hill. He got shot in the shoulder, carried on, stepped on a landmine, and then got shot in the jaw and he still survived and made it up the twelve hours to get from the beach to beyond the pillboxes, and he still doesn’t describe himself as a hero. I just find that remarkable, that heroism... there’s something about that generation and their cause that’s so powerful. They say – “I’m no hero but I served in the company of heroes.” I love that sentiment, and it’s something that we tried to capture. MC: It’s really, really challenging to honour that in a personal way. The theme that we stuck to was that this was about the greater good and representing common men. And the vulnerability – these were terrified kids going to war for the first time at 19 years old. Very different from some of the stories that we’ve told in the past. LH: The age is sometimes the hardest thing to grasp. 18 is still basically a kid. MC: Like babyfaces right? Some of the characters you play with are sergeants and lieutenants and they’re older and established. Zussman and Daniels [who you play as], you actually follow them from childhood. MC: Well, maybe not that structured. Certainly we knew that we were going to tell this tale, we were going to tell these stories, that we wanted to really honour the war. Fictionalising a fantastical story with a war that had this much importance in human history wasn’t going to work. So respect and honour was something that we said: 'Look, if we’re going to do this, we’re going to tell the story of the men and women who really put their lives on the line in a human history moment of tyranny, and they could’ve changed the outcome' and so it really started from there. It was about the squad and the importance of the squad and the common man – and women – fighting for this cause that was way bigger than themselves. We knew that we were going to... the tonality had to capture really what happened. It was going to border on brutal and violent in a way that had to really represent what happened there at the time. We knew that the cause was set amidst some tragedies and atrocities that were really shaping the global effort and we weren’t going to shy away from that either. Frankly there was a lot happening in the 40’s around the role of women... and the segregation of races that were real as well, and we didn’t want to shy away from those things. We didn’t want to dishonour the fact that those things happened – but we also wanted to make sure that we were respectful and not showcasing anything unnecessarily or gratuitous in gameplay or narrative. So it was always a fine balance. LH: You seem to be quite cautious about being respectful and paying respects this time. Previous World War 2 CODs had an almost matinee sheen to them. Do you think it’s harder in this climate to tackle something that is so real, and had all these atrocities? MC: I think that’s right. Nearly everybody we know had somebody who was touched by this, right? Whether it’s a grandfather, a great grandfather that served in the war... we certainly have developers in the studio who come from places like Poland and others who can look back in history and talk about what it meant to them and so yeah – the delicacy, the nature of what really happened was an important thing to hold onto. LH: Can we talk about the characters; you mentioned Rousso the French Resistance woman? And in the character art there’s a child – how much can you say about other characters? MC: There’s a German family and two sisters, there’s Crowley – a British officer – there’s an African-American officer from another regiment. So across the game, in all three modes – and particularly in MP and Campaign, but really equally across all three modes – we really wanted to capture that it was a global cause, right? It was... the Allied force was a global force, the German force – the Axis force – was more than just the Nazis. It was Germans as well as other nations involved, and so it was important for us to not... this isn’t an American war, this isn’t a story of an American squad – this is a global cast and so yeah; you’ll see some really powerful performances on both sides of the war. You’ll see some powerful performances by the men and women who sacrificed, families that were involved. LH: Do you just play as Red and Zussman or do you have moments with the other characters...? MC: Yeah. You’ll play as Russo, the French Resistance woman... we want the story to be meaningful and for that we do want you to stay attached to the characters in a way that gives them time for them to develop and breathe, and so character hopping makes it hard to keep that connection. I that moment where you join with the French Resistance is a really nice moment – but primarily you stay with the squad, primarily you stay with Daniels. LH: There was mention earlier about how some of your squad can help you out - giving you ammo, for example - and that some of them can die. Can you lose support in that case? LH: So could you, in theory, lose the ammo guy and then you lose that support? MC: Yeah. So the squad is a really interesting focus for us for. In combat, yeah, you can be separated from guys with key abilities that would change how you play. If you’re not with the ammo guy then you have less ability to replenish your ammo. Also the human loss of your squad is an important emotional impact, and there’ll be times that you’re separated and you may lose people that are emotionally important to you, so all of those things can happen, yeah. MC: There’s a through-story that we really wanted to tell, and so we’re not describing this as a branching storyline. LH: I want to talk around as much of the multiplayer stuff as we can, although I appreciate you can’t say an awful lot. With the Headquarters stuff – the social space you’ve got - can you just sort of explain the shape of it? MC: Absolutely. This is the evolution of [bringing] your character to life, giving them the space and now giving them a world. 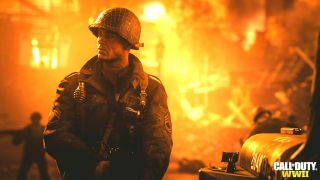 So what we want is for players to really explore the community – the Call of Duty community, what makes it great in a social living space where it’s about being rewarded, it’s about being recognised, it’s about being social – there are gameplay aspects to it in the Headquarters that are unique to your experience there. There are social opportunities. There’s opportunities to do things that really reward publicly your achievements. I think for multiplayer specifically, the act of Prestiging is really powerful – all these times you’ve Prestiged and you can largely only do it, historically to date, offline in your own home with a little bit of fanfare. Now you have a place to really celebrate that achievement in public amongst dozens of your friends and community members, so. Yeah there’s a lot more to come on Headquarters – as both a social and activity driven space that really showcases and celebrates your achievements and your personality. LH: When you say about Prestige do you just mean people can see your Prestige or is that going to be like standing on a box in front of everyone while someone pins a medal on you? MC: Yeah... that kind of thing, yeah. LH: Will it function in a similar way to other similar gameplay spaces where there’ll be like emotes, and other gameplay things like bounties? MC: Yeah I don’t how much detail we can go in to, but you can imagine... those social interactions are important, right? So it’s about... personalisation of your experience and celebrating your progress and working as a community and being members of a community that’s off the front line, right? LH: How much can you talk about War mode? The asymmetrical, narratively led stuff? From the German perspective it would be 'hold the line at the hedgerows, if you lose the line pull back to the barn, and if you lose the barn, pull back to the radio tower – if you lose the radio tower, defend the 88s' right? And so you have this push-pull of these real true collisions of Axis versus Allies and it’s really powerful. LH: And these will be, I guess, little set piece moments? They won’t be a connected story in their own right, they’ll be like scenarios? MC: Scenarios, that’s right. A series of these objective-driven conflicts. LH: The move back to World War 2 tech in multiplayer after all the robo-legs and jet packs will be a shock to many. How are you handling that?